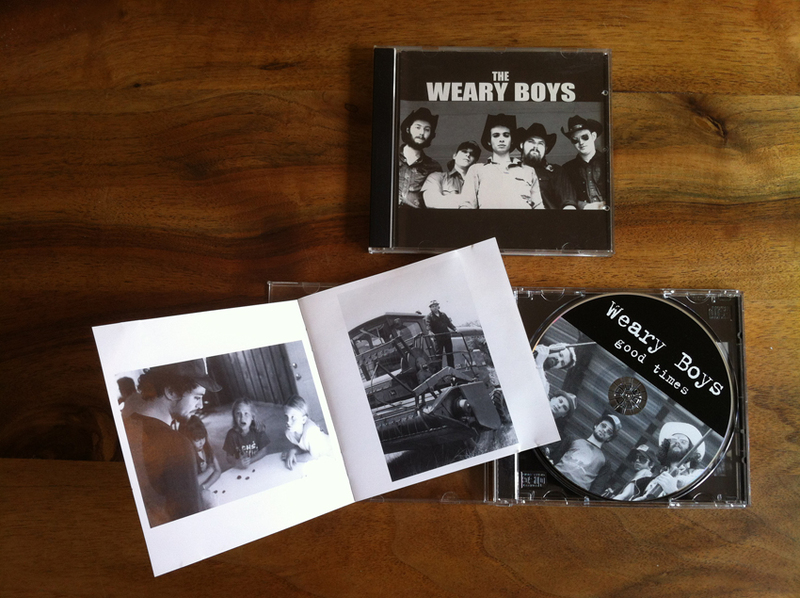 The sad demise of the Austin band The Weary Boys in 2007, saw the end to one of the best live bluegrass blues bands i’d seen perform. They produced six CDs in six years (2001–2007), their energy was boundless, their music: great mix of speedy ‘blues grass’ riffs and high kickin melodies, and last but not least; charisma – they had it by the bucket full. During their career, the Weary Boys emerged as one of Austin’s premier string bands, coupling manic fiddle and upright bass with a raucous rhythm guitar and songwriting that ranged from poignant ballads to hard-drinking honky tonkers. The band formed in Humbolt County, Calif., in 2000, behind Mario Matteoli, Darren Hoff, and Brian Salvi, and moved to Austin shortly afterward, where they picked up bassist Darren Sluyter and drummer Cary Ozanian. With the release of their self-titled debut in 2001 and regular gigs at the Continental Club, the Weary Boys quickly invigorated Austin’s dominant country scene with their bluegrass harmonies and youthful fervor, mixing the local outlaw aesthetic with the emerging sound of punk pickers like Old Crow Medicine Show and the Avett Brothers and locals like the Meat Purveyors. Each year brought a subsequent release from the group, including 2002’s exceptional Weary Blues and the far-reaching gospel album Holy Ghost Power in 2004, and saw primary songwriter Matteoli further honing his craft. Following the release of Jumpin’ Jolie in 2006, Matteoli left the group to pursue a solo career, and the Weary Boys added Matt Downing on banjo for the release of their final album, Coalinga, which features mostly traditional covers. The group finally disbanded in late 2007. When the Weary Boys rolled into Austin from California in 2001, they set the town on fire with their high-octane take on string music. Across six albums, the local quintet showcased the songwriting of Mario Matteoli and Darren Hoff atop a blazing fiddle from Brian Salvi, and the furious rhythm of Cary Ozanian on drums and upright bassist Darren Sluyter. “Everyone remembers our shows,” admits Matteoli. “It was a really fun thing to do in Austin for a while, and I think a lot of people experienced it. It’s just this really fast, simple music, but it had this way of making people happy. At the moment the new Americana movement was beginning to gain national traction behind acts like Old Crow Medicine Show and the Avett Brothers in 2007, the Wearies disbanded. While the members have forged new projects – Matteoli’s The Preservation; Darren Hoff & the Hard Times; the remaining trio’s WoodsBoss – the Weary Boys’ chemistry still endures five years after parting, as evidenced by a preview of the one-off reunion two weeks ago at the Do512 Lounge. “It was pretty natural,” agrees the frontman. “We’ve had it instilled in us, but it’s not our lives anymore and that’s how we want it to stay. One of my best friends blogs,have a listen,theres a lot to like. I surprise how a lot attempt you put to create any such fantastic informative web site. after that i propose him/her to visit this blog, Keep up the fastidious job. stolen email addresses at Yahoo, click Yahoo.